There is nothing like a mint for after dinner or when you are unsure if your dragon breath will scare away the bridesmaids or dancing boys you flirt with. Having these very reasonable bachelorette party mints will take away the spice while also sweeten any bachelorette party. You can also use them as bachelorette decorations on tables. Get some for all the girls at the low cost of 12-15 cents each. These are the top bachelorette supply because there is always some type of drinking at any bachelorette party. What better than to drink from a willie straw. There are many types of straws and you can find them at bachelorettepartyfun.com. The straws pictured are a party favorite and are under $5.00 for a pack of 10 (really .50 cents each). You can also use them as bachelorette party decorations or magic wands to scare away the creepy guys. Remember those pens that men used to turn up and down and the girl would lose her clothes. There is now a version of it with a male hunk that strips when you turn the pen upside down! Get one for each of the girls as these pens only cost $1.99. Everyone loves bubbles, including bachelorette parties! You and the girls will enjoy filling the room with bubbles when using these willie shaped bubble dispensers. Get one for each bachelorette and blow away. Great for in home parties, bars, restaurants or being at a pool or spa! Besides blowing, everyone loves sucking suckers, especially these bachelorette favorite candies. These bachelorette suckers come in multi colors and are only .95 cents each. They are great to give each bachelorette and can also be used as bachelorette party decorations. Great to get and place in bachelorette party goodie bags for each bachelorette. You will be everyone's hero when you hand these bachelorette party candies out the girls, especially after dinner or going into a bar. Staying on the drinking and eating theme, the bachelorette colored shot glass is a bachelorette favorite. For only $2.69 each, get one for each girl and do a bunch of bachelorette toasts to the bride-to-be (And everyone else). These durable bachelorette shot glasses can also be used to hold small bachelorette candy. If you want to be naughty, fill them up with Kahlua and Milk or get a BJ shot. You are in for a memorable time. 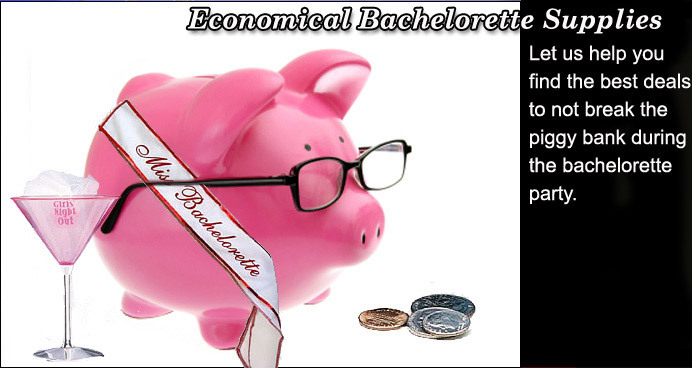 We hope you get some ideas from our economical bachelorette supplies section. Please email us with any bachelorette party supply ideas you may have at bachelorette@bacheloretteparties101.com. We look forward to hearing from you soon and remember to order your bachelorette party supplies early.